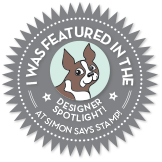 This weeks Simon Says Stamp Monday Challenge, is A Walk On The Dark Side. I was absolutely ecstatic and knew exactly what I wanted top do! So out came every piece of Nightmare Before Christmas stuff I could find. However, the first thing I did was pull out my thin metal sheets and my tools and spent the day trying to create the iconic Jack and Sally silhouette on the hill side. Overall it didn't come out as well as I had hoped, and I had to use some paint to offset the characters because the lines didn't seem defined enough to me. But it was way better than I figured I could do when I started, so I was pretty happy. I got that stuck down, and with a fair amount of irritation and effort I finally got the inside edge to stop getting bent every time I opened and closed my art journal lol. Then I used black gesso on the page next to it, layered up a laser cut Nightmare Before Christmas sign on some white card stock and stuck that down. Then I ran the strip of ribbon across the bottom. Then I took two plastic cutouts, one of Zero and one of Jack and put them down. Then I pulled out my 20th anniversary edition of the Nightmare Before Christmas book, and found the portion I wanted to use and wrote that out in white gel pen, and it was going to well until I messed up on that one word, so just kind of try and ignore the crossed out blob of white near the bottom lol. Even though it did not come out perfectly I am very happy with how it did turn out, and I know it will always be a layout that is near and dear to me. Enjoy! I love the white swishes above the hill and around the people!!! Wonderful spread!! Oh, this is so cool. It jumped right out at me when I was looking at the photos on the Simon Says Stamp link up for "A Walk on the Dark Side."